Best known for his rich, colorful paintings of cakes, ice cream cones, and candy counters, California artist Wayne Thiebaud (b. 1920) has been an avid and prolific draftsman since he began his career as an illustrator and cartoonist. Featuring subjects that range from deli counters and solitary figures to dramatic views of San Francisco’s plunging streets, Thiebaud’s drawings endow the most common objects and everyday scenes with a sense of poetry and nostalgia. 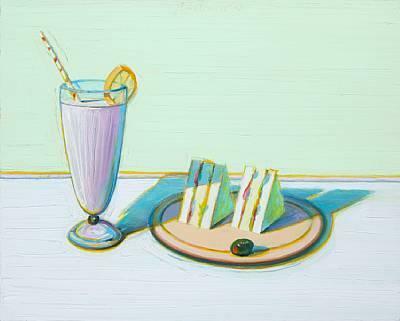 Milkshake & Sandwiches by Wayne Thiebaud sold for over $1 million at Bonhams & Butterfields. 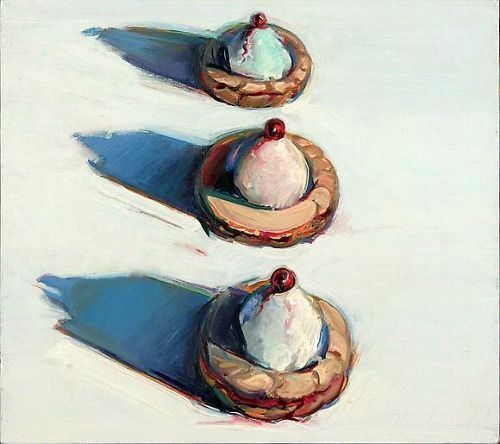 Art © Wayne Thiebaud/Licensed by VAGA, New York, NY. 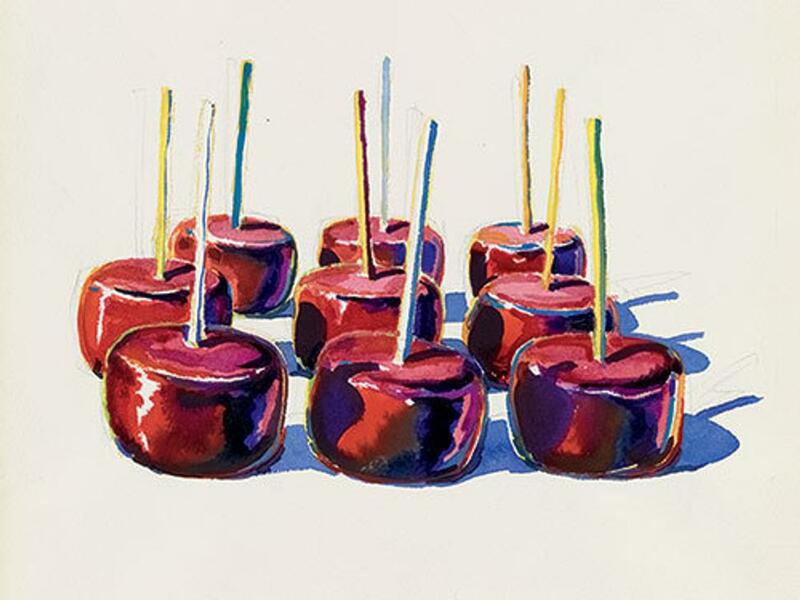 Opening at the Morgan Library & Museum in New York on May 18, Wayne Thiebaud, Draftsman is the first exhibition to explore the full scope of the artist’s works on paper, including quick sketches, finished pastels, watercolors, and charcoal drawings. The earliest of the almost eighty-five works on view are cartoons from the 1940s, while the most recent feature landscape drawings inspired by the Sacramento River valley. The show will run through September 23. Wayne Thiebaud (1920-), Shelf of Pies, 1960, Private Collection © Wayne Thiebaud/Licensed by VAGA, New York, NY. Photography by Graham S Haber 2017. After studying at Frank Wiggins Trade School in Los Angeles in the late 1930s, Thiebaud began his career as a commercial draftsman, working as a cartoonist, designer, illustrator, sign painter, and advertising art director. The clarity and efficiency of advertising design became a major influence on his later work, as did the graphic stylization typical of cartoons and comics. In the early 1950s, stimulated by his interest in art history, Thiebaud decided to become a painter. While teaching at Sacramento Junior College in 1956–57, he took a leave of absence to spend a year in New York. “I was very fascinated by people like de Kooning and Kline and went to New York expressly to try to meet them and hear what they were up to.” For a while Thiebaud adopted the gestural style of these Abstract Expressionist painters, as can be seen in the drawing of a Third Avenue store. During the 1950s, Thiebaud often drew shop windows and market stalls. At the end of the decade, he began zeroing in on the food on display: rows of pies, candy sticks, hamburgers. Combining a geometrical approach from his experience in advertising design with an attention to artificial lighting learned while working at Universal Studios in the 1940s, he created a new kind of imagery, which brought him instant fame when these works were first exhibited in New York in 1962. Working in different mediums, he has compared the process of moving from one technique to another to musical arrangements for different instruments, which preserve the form and melody of a piece while changing its timbre and texture. During the 1970s, Thiebaud’s work began to show a greater engagement with tradition. He found inspiration in the old masters and in the art of Daumier, Degas, Bonnard, Morandi, and others. In his drawings he relied increasingly on techniques such as chiaroscuro, foreshortening, and hatching and cross-hatching. His figure drawings also changed, as he devoted more time to working from the model. This attachment to the past distinguishes Thiebaud from Pop artists such as Roy Lichtenstein and Andy Warhol, to whom he has often been compared because of his fondness for depicting ordinary objects. Thiebaud’s large charcoal still lifes of this period were made while he worked as a teacher at the University of California, Davis. After setting up objects in the classroom and assigning specific rules of composition, he would make his own drawing as a way of demonstration for his students. Though such a process reflects academic tradition, Thiebaud’s drawings also presented a modern sensibility with their empty center that conveys his admiration for Degas. Starting with quick sketches made from observation or memory, he then rearranged elements from these sketches into larger, more elaborate compositions, “erasing, smudging, and fussing around with form.” Adopting a similar method to depict the landscape of the Sacramento River valley, Thiebaud relied increasingly on his imagination to combine the flowing line of the meandering river and the repetitive patterns of the tilled fields into compositions that evoke vast jigsaw puzzles. Whether done as a daily exercise or to jot down ideas for paintings, Thiebaud’s sketches are an essential part of his activity as a draftsman and highlight the importance of drawing in his process. In compositional sketches, he worked out the size and placement of each element in relation to the others. At times he experimented with various light effects or vantage points. In many sheets, he used lines to frame different scenes, calling to mind the organization of a storyboard or the panels of a comic book. Throughout his career, Thiebaud has made a rich variety of drawings to examine the relationship between medium and image, exploring what happens if one “transposes a thick, rich colorful painting into black and white in a sparse or less sensual medium.” From sketches to finished compositions, this exhibition illuminates the artist’s painstaking process and the evident pleasure he derives from the act of drawing. 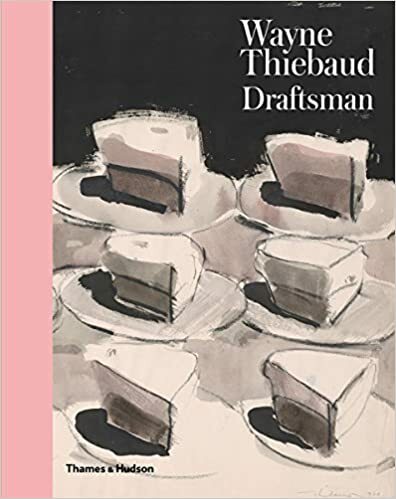 The accompanying catalogue, Wayne Thiebaud, Draftsman, features 63 plates of works in the exhibition and 20 sketchbook pages. It also contains a foreword by director Colin B. Bailey, an essay by Isabelle Dervaux, and a conversation with Wayne Thiebaud.